eMarketing – Let Award Winning Email Campaigns developed and implemented by Sweet Marketing Solutions increase ROI for your company! 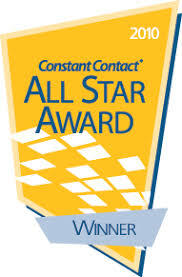 Since 2010, Sweet Marketing Solutions has received the Constant Contact All Star Award. Why Email Marketing with Sweet Marketing Solutions & the Constant Contact® platform? Sweet Marketing Solutions has been branding, strategically planning, creating engaging content and implementing email marketing campaigns for our clients for many years. Clients that contract our firm for this part of their marketing want results. Our email campaigns deliver those results. They value the expertise, time and money savings they achieve by having our award winning team write, manage and implement email marketing campaigns. With Constant Contact, you can create and send top-notch email newsletters and promotions with no technical expertise. We make everything easy for you, including list management and reporting—and we give you free live support when you need it. With Constant Contact, you have everything you need to be successful at an affordable price. Email marketing is one of the most powerful and effective tools available to you and Constant Contact is hand down the best deal around. Let’s put them to work for your business today. FREE 60-Day Email Marketing Trial!